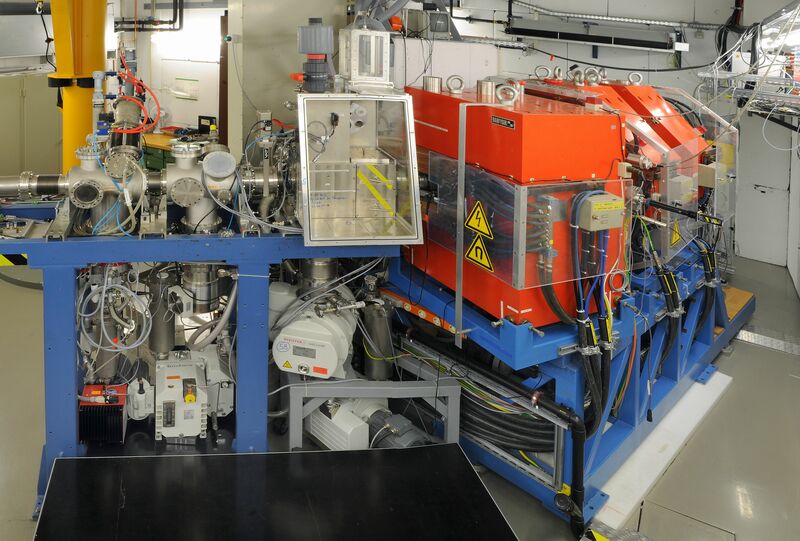 Several atoms of the superheavy element with atomic number 117 have been created and observed by an international collaboration working at the GSI accelerator laboratory in Germany. The measured decay properties match previous data, strengthening the case for official recognition of 117 as a new element. New findings obtained in the present work mark an important step towards the capability to observe still more long-lived superheavy nuclei, as expected to exist on the 'island of stability' of superheavy elements. The periodic table of the elements is to get crowded towards its heaviest members. 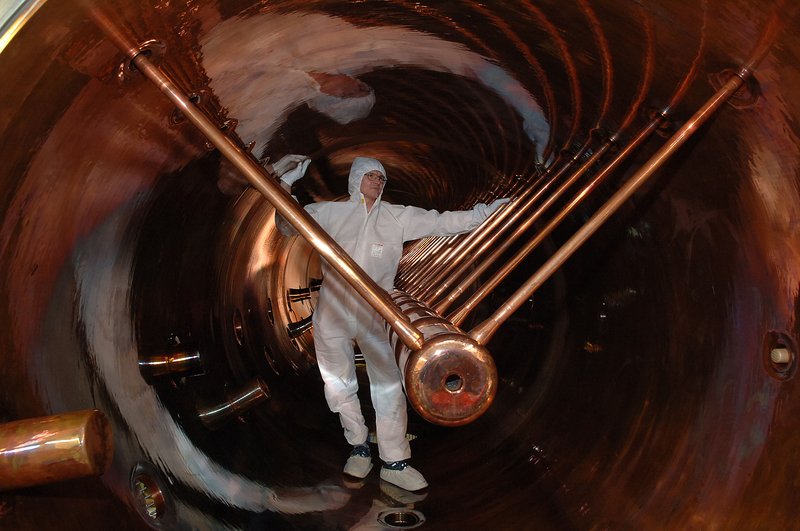 Evidence for the artificial creation of element 117 has recently been obtained at the GSI Helmholtz Centre for Heavy Ion Research, an accelerator laboratory located in Darmstadt, Germany. The experiment was performed by an international team of chemists and physicists headed by Prof. Christoph Düllmann, who holds positions at GSI, Johannes Gutenberg University Mainz (JGU), and the Helmholtz Institute Mainz (HIM). The team included 72 scientists and engineers from 16 institutions in Australia, Finland, Germany, India, Japan, Norway, Poland, Sweden, Switzerland, the United Kingdom, and the United States. In the decay chains, both a previously unknown alpha-decay pathway in Db-270 (dubnium – element 105) and the new isotope Lr-266 (lawrencium – element 103) were identified. With half-lives of about one hour and about 11 hours, respectively, they are among the longest-lived superheavy isotopes known to date. As unwanted background events are present in all superheavy element experiments, the longer-lived an isotope is, the harder is its reliable identification. 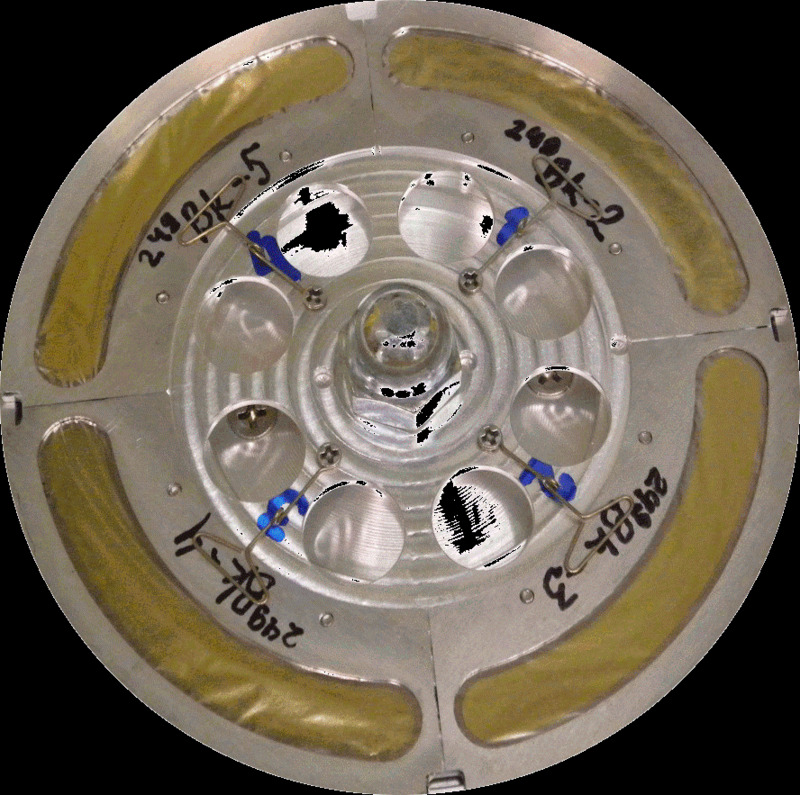 The present experiment, for which TASCA was significantly upgraded to better separate unwanted background products and thus to allow more sensitive identification of superheavy nuclei, proved that their reliable identification is now possible. "This is of paramount importance as even longer-lived isotopes are predicted to exist in a region of enhanced nuclear stability", explains Düllmann. Prof. Horst Stöcker, Scientific Director of GSI, adds: "The successful experiments on element 117 are an important step on the path to the production and detection of elements situated on the 'island of stability' of superheavy elements." 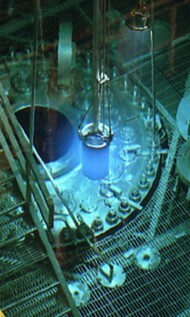 Blue glow of Cherenkov radiation visible at ORNL's High Flux Isotope Reactor during a fuel change-out: Intense irradiation, followed by chemical separation and purification, produced the necessary berkelium target material for the element 117 experiment. 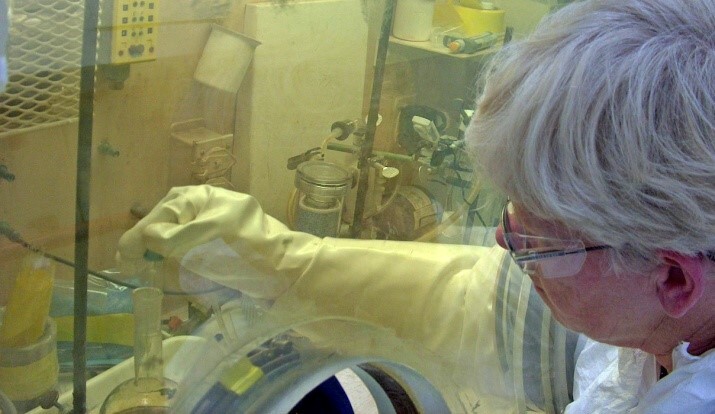 Rose Boll conducts chemical separation and purification for berkelium-249 production at ORNL's Radiochemical Engineering Development Center. Target wheel produced at the Institute of Nuclear Chemistry at Mainz University containing the berkelium-249.